The Salvador Dali Museum web site is a wonderful source of information about Dali, his life and work. The museum is in St. Petersburg, Florida. For information about professional art appraisers visit the web site of the International Society of Appraisers. We own close to 1000 of the approximate 1500 authentic Dali graphics in our personal collection for reference. 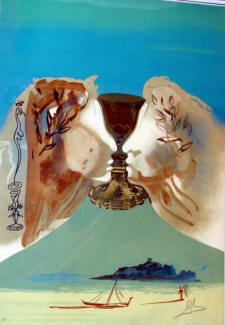 At Bengis Fine Art we have many works for sale by Dali, Chagall, Miro, Matta, Warhol and many other modern masters. You may find this information useful in the study and collection of Modern and Contemporary Art. Abstract Art uses color and form to create images that do not represent natural objects. The term has also been used to describe art that depicts real forms in a simplified basic manner, alluding to the original natural subject. Aquatint is a printing technique similar to etching which uses an acid resistant resin powder to create a tonal effect in the ground. Arches paper is a durable, air-dried type of paper preferred by printers and watercolor painters; made in the Arches paper mill in Lorraine, France. Art Deco was a purely decorative art movement in the 1920s and 30s influencing architecture and interior design as well as painting, graphic arts and fashion. The style was seen as ultra-modern and elegant. Artist’s Proof is technically an impression of a print taken during the printmaking process to show the progress of the work. In current practice Artist’s Proof are identical to the numbered prints but not counted in the limited edition. These prints belong to the artist and may number as many as twenty; by convention the artist does not sell these prints right away. Avant-Garde means advanced guard in French and is used to refer to new and experimental styles of art. The term has been used since the 1860s to describe modern art movements such as Impressionism, Fauvism, Cubism and other movements. Catalog raisoné is a comprehensive catalogue of the works of art of a single artist. It is a meticulous list of works and describes each work so that it may be dependably identified by others. Constructivism was a Russian movement in art and architecture from 1919 which viewed art as part and conveyance of social revolution. Contemporary Art generally refers to art produced since World War II. Cubism developed by Pablo Picasso and Georges Braque based on some ideas of Paul Cézanne. An important art movement developed from 1906 until 1914 in France and spread throughout Europe. It represents all the surfaces of depicted objects in a single flat plane as if all sides of the objects are visible from the same point of view. Dadaism was an anti-war cultural movement that began in Zurich during World War I. Dadaism rejected prevailing standards in art and culture. Dry Point is an engraving technique. A needle is used to incise the bare metal plate raising a fine burr along the incised line. The burr holds a good amount of ink printing characteristicly rich velvety blacks.The burr wears away quickly evidencing early impressions; highly prized by collectors. Engraving are prints made by cutting grooves in a hard, flat surface, usually a copper plate, to create a design. Ink applied to the plate is held by the grooves and transferred to paper during the printing process. Etching uses a plate coated with wax or other acid-resistant material. A design is scratched into this platewhich is then exposed to acid cutting the design into the plate. The coating is removed and ink applied to print the image. Expressionism is artistic distortion used to evoke an emotional effect, usually angst. Fabriano is fine art paper made in Fabriano, Italy used for water media. Fauvism Les Fauves is French for The Wild Beasts and refers to an early 20th century art movement which emphasized intense and unorthodox use of color, simple lines and exaggerated perspective. Henri Matisse was a leader of the short-lived movement. Giclée is the process of making fine art prints using a computer source and an inkjet printer. Archival – fade resistant – inks are used and prints can be on canvas as well as paper. Gouache is a matte water color paint made opaque by the addition of gum arabic., a chalky filler. This also refers to the techinique of painting with this medium. Guarro is fine drawing paper made in Guarro, Spain. Holography is an advanced form of photography that allows an image to be recorded in three dimensions. Some holograms are created in two or three layers giving the illusion of depth. Impressionism was a 20th century movement of Paris-based artists who began exhibiting their work publicly in the 1860s. Impressionism is characterized by visible brush strokes, emphasis on the changing qualities of light to evoke the passage of time and the depiction of ordinary subjects. The title of Claude Monet’s work Impression, Sunrise led to the name of the movement. Japon is usually laid paper, somewhat translucent and fibrous, satin or iridescent and flocked texture. Also called Japan paper. Kinetic Art is sculpture that has moving parts. Marcel Duchamp’s Bicycle Wheel, 1913 was the first kinetic sculpture. Laid paper is handmade and laid on a wire form leaving uneven wire marks on the paper. Lithograph is a printing process that creates an image on a plate with an oil-based water-repelling compound. Mobile is a hanging, kinetic sculpture of balanced objects and rods which freely rotate. Alexander Calder invented the mobile in 1931; Marcel Duchamp suggested the name. Modern Art generally refers to artwork produced from the mid-19th century until the 1970s. Modern Art emphasized emotions, themes and abstract concepts. Op Art , Optical Art uses optical illusions to evoke movement, warping, flashing, vibration and hidden images. Pochoir is a stencil used in visual arts to draw or paint identical shapes or patterns every time it is used. Pop Art emerged in the United States in the late 1950s and drew on themes from popular culture, advertising and comic books to appeal to a broad audience. Realism is a style of painting that depicts everyday subjects as they actually appear. Serigraph is a method of printing which uses a stencil to create a sharp-edged image on a piece of silk or polyester. A separate stencil or screen is created for each color of the image. Ink is then forced through the fine mesh of the fabric onto paper, one color at a time to create a finished image. Screen printing – see Serigraph. Stabiles are abstract, static sculptures originally created by Alexander Calder. Surrealism is an art movement which began in the mid-1920s and features surprising elements and unexpected juxtapositions. The unconscious mind as a source of inspiration is central to the movement. Symbolism in art refers to the use of a particluar image as an iconic representation with a particular meaning; Salvador Dali’s soft, melting clocks representing the relative nature of time. Woodcut is a relief printing technique produced by cutting an image in a hardwood block leaving the parts to be printed standing out on the flat surface. Woodcuts are usually printed on a press but may also be printed manually by rubbing with a frotton. Wove paper has the appearance of a uniform and smooth weave and flocked texture.